Not all window film is created the same, or equal for that matter. For example, you have the option of going with a non-metal window film as opposed to metal film, which can cause some issues with your electronics amongst other disadvantages. Metal film is dyed and contains traces of metal which gives it a darker look. It is the metal in the film that causes issues for the user when it comes to the radio, cellphone, GPS or other devices. Luckily for us there are other options that don’t involve metal. Dyed film is the most cost-effective solution on the market. It is however less functional than other options. Light rays are blocked because of the dye added to the film. Upon application, the dye is added by a layer next to the adhesive. The dye in the film absorbs solar heat and therefore blocks heat from entering the interior of the vehicle. This option is more about appearance and less about functionality as the heat reduction is not very high. The finish is flat and opaque which allows for visibility from the inside and privacy from the outside. If used on a vehicle, it will appear black in color. The dye in the film can fade over time. Instead of using metal for design, carbon film is a non-reflective matte-like finish. This type of tint is black and does not fade over time. The matte finish is a sophisticated option compared to other types of non-metal window films. Carbon film will block out 40% of solar heat/light and sufficiently cools down the interior of the vehicle or house. Not only does it prevent the heat from getting in, but your upholstery, interior, and furniture is also protected from direct sunlight. Ceramic film is one of the most expensive types of window film but also the highest quality. Although we are not big fans this product due to the sheen or hint of reflection it has, it contains no metal, dye or carbon and only a carbon particle. Ceramic window film blocks up to 50% of solar heat and light while still allowing maximum visibility, day or night. Because ceramic film contains no metal, there are no problems with the functioning of radios, GPS and other devices. 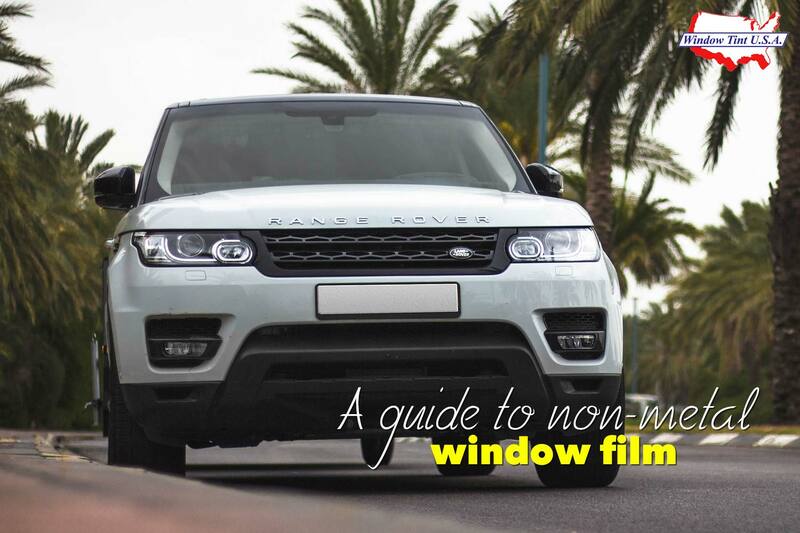 When it comes to ultraviolet light, this film blocks up to 99% of rays from entering the interior of the vehicle which further protects occupants and the interior of your vehicle. The color of the film remains intact and will uphold its appearance for many years. Ceramic window film is strong and acts as security and protection film preventing the window from shattering. In our opinion this is the go to film to use. The Crystalline Series is a non-metalized window film that encompasses the best of everything. It rejects more heat than other darker window films (up to 97% reduction of infrared rays), stops up to 60% solar energy, yet keeps the appearance of your vehicle the way it was meant to look. It also blocks up to of 99.9% UV Rays (that’s A & B) giving passengers and driver a sun protection factor of 1000! Basically, this film has been designed to keep you and your vehicle cool and sun safe, while still letting in visible light and does not have the reflection other window films have. A darker tint will reduce glare but when making your decision you should consider going for a combination of glare reduction and visibility from the inside out. If you’re interested in appearance as opposed to functionality then a dyed film would be the better option for you. Dyed film does however provide optical clarity with strong glare control when it comes to headlights and other bright lights. If visibility is a concern for you, then ceramic film would serve you well. It also offers low reflectivity at night meaning that your vision will not be obscured. There are many benefits to tinting your windows including protection from the sun, its UV rays and heat as well as privacy and keeping the occupants of a vehicle safe should anything happen to the windscreen. These benefits apply to most types of window film. When it comes to choosing the type of non-metal window film, you should base your decision on the reason for wanting window film. This could be down to the purpose each type of film serves, your budget and what you can afford or are willing to spend, and then lastly the kind of look you’re aiming to achieve. Remember that each type of non-metal window film has its own properties and advantages. If you’re still not decided on where to next, Window Tint USA offers various options and can provide you with the advice you may need to decide on your automotive window tint.